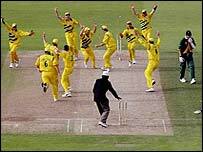 Australia reached the 1999 World Cup final after a dramatic semi-final tie against South Africa. Bangladesh produced the shock of the 1999 World Cup with a much-talked about victory over Pakistan. Kenya's 1996 World Cup win over the West Indies remains the biggest upset in the tournament's history. England reached the 1992 World Cup final after two memorable but differing wins over South Africa. Lance Klusener was the star of the show in 1999 and was key to numerous South African victories.